Tvasta Manufacturing Solutions, an emerging additive manufacturing startup, and Civil Engineering Department, IIT Madras, have established a one-of-a-kind 3D printing laboratory - the IIT Madras Printability Lab. 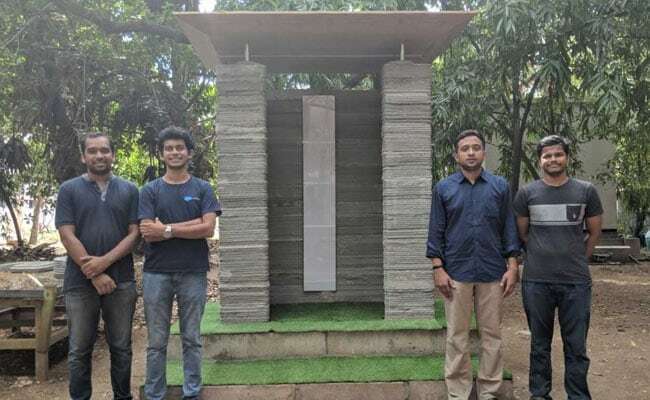 Indian Institute of Technology (IIT) Madras faculty and alumni have developed the country's first 3D Printing Construction Technology and have successfully built India's first 3D Printed Structure, according to a statement from the Institute. Tvasta Manufacturing Solutions, an emerging additive manufacturing startup, and Civil Engineering Department, IIT Madras, have established a one-of-a-kind 3D printing laboratory - the IIT Madras Printability Lab - to take this indigenously-developed technology to the mass market. The start-up aspires to completely automate construction, including placement of reinforcements and finishing, by re-envisioning the construction process, the statement said. It aims to develop a platform and a specific process to a miniature single storey house of 320-sq.ft within three days. 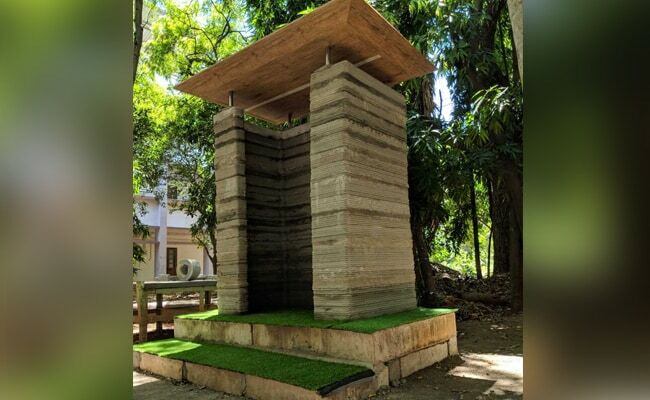 A prototype structure that has been printed in IIT Madras will serve a base foundational model for accelerating R&D and testing in Tvasta's road to making affordable sanitation and Affordable housing a reality in the country, the statement added. "Building Technology and Construction Management Division at IIT Madras is a unique Research Group in the country which has the expertise in materials as well as construction technologies which is relevant to this effort," Prof Koshy Varghese, Department of Civil Engineering, IIT Madras, who has been a driving force in the establishment of this research in IIT Madras, said. Prof Varghese added that his team has been working on developing 3D Printing technology in the area of Construction from 2016 and has conducted International Workshops and awareness sessions for this in Chennai. "In addition, the institute is exploring automated construction methods and novel formwork systems for rapid housing construction," he said. (L_R) The founders of Tvasta startup: Santhosh Kumar V, Adithya VS, Vidyashankar C Iyer, and Parivarthan Reddy B. He also noted that IIT Madras worked on other housing technologies such as GFRG and Cold-Form Steel, which are now at a mature stage and can enable rapid construction to cater to India's massive housing demands. Speaking about the importance of this technology to construction industry, Prof Manu Santhanam, Department of Civil Engineering, IIT Madras, who has been working with the Tvasta team, said, "3D printing of concrete gives a new dimension to construction. This technology can best meet the complex demands of modern architecture with concrete. The use of a combination of binders and optimally proportioned and sized aggregates, along with suitable chemical additives, the concrete mixture is fine tuned to achieve the rheological characteristics that make it possible for extrusion of the material and shape retention after placement." Highlighting the benefits of this technology to the country, Ms Kranthi Valluru Assistant Secretary, MoHUA, said, "It is very heartening to see that institutions like IIT Madras and new startups such as Tvasta building technologies like 3D printing for construction sector in India from the ground up under the 'Make in India' platform. Such technologies help in expediting construction with optimal use of resources. They help in bringing a paradigm shift in construction sector which is very much the need of the hour." Talking about their plans, Mr Adithya VS, Co-founder of Tvasta said, "Tvasta will be building India's first 3D printed house within the next one year. The impact of 3D printing in construction will be primarily focussed towards the 'Housing for All' scheme under the Pradhan Mantri Awas Yojana and Construction of Toilets for the 'Swachh Bharat Abhiyan'. Tvasta is working withmultiple stakeholders in the Construction Industry to make 3D Printing technology suitable and viable for the Indian construction industry." The Founders of the startup are Mr Adithya VS, Mr Parivarthan Reddy, Mr Vidyashankar C and Mr Santhosh Kumar. This industry-academia symbiosis is spearheaded by Prof Koshy Varghese, Prof Ravindra Gettu, Prof Manu Santhanam, Prof Koshy Varghese and Prof Benny Raphael from Civil Engineering Department and Prof G Saravana Kumar from Engineering Design, IIT Madras.